We have been making pizza on and off for a few years now, with varying levels of success. There were a couple of times when we did pretty well and thought we had definitely cracked it, but haven’t been able to keep it consistent. With our old not very hot oven we had a clever ploy to make it hotter by heating it up with the grill for a long time and that worked well, but we have a new oven now which is hotter and better for pizza so don’t need to do that. Inspired by a recent visit to a Pizza Express pizza-making masterclass, we decided to try again. We had two main aims: 1) nice thin, crisp base and 2) interesting toppings. At the masterclass, one of the pizzas that was demonstrated to us had spicy sausage and salami on it when it was cooked and then afterwards had bits of fresh mozarella put onto it, along with what we thought was particularly interesting – watercress dressed in pesto. We were keen to do something similar and bought some watercress, but when we opened the bag it was rather squashed so gave it a skip and dressed the mozarella in the pesto instead, which turned out rather well. We had success with our dough which turned out very stretchy and made it possible to make a nice thin base without it breaking. I had always thought it was cheating to use a rolling pin, but at the masterclass we had used one so did it at home too and it does work very well, so we’ll definitely continue to do so. 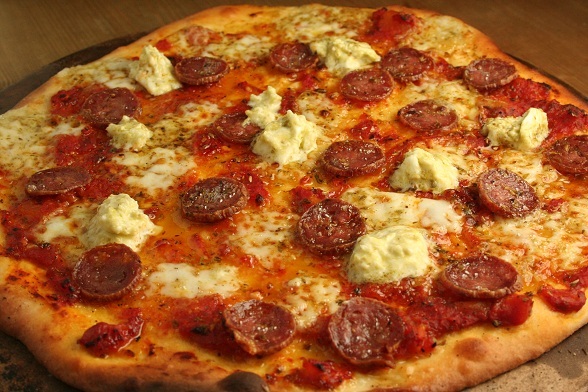 We had some really nice salami which we put onto it – it can feel like a waste to put good salami on pizza, but this had a wonderful deep, slightly earthy taste to it and crisped nicely. We added most of the pesto-marinated mozarella (British buffalo mozarella from Laverstoke Park) to the pizza before cooking and kept some of it for topping afterwards too. We made a quick tomato sauce from a tin of tomatoes, some garlic and oregano. After cooking for a short while, we put it into a sieve to allow some of the liquid to drain away – we’ve found that in the past our pizzas often end up soggy and figured it was probably from our sauce being too wet. The liquid that drained away tasted like delicious garlicky tomato soup, maybe we should have planned to have that as a starter! So after we had rolled out the pizza and tossed it around a bit while trying not to completely cover the kitchen in flour, we topped it with some of the drained tomato sauce, some sliced salami, some pesto-marinated mozarella and a sprinkle of lovely fragrant dried oregano. Into the oven at 270C for as long as it took to look like it was done and then topped with a little more mozarella and served. Delicious. The pesto worked very well on the pizza – its nutty, herby oiliness combined well with the sweet acidity of the tomato sauce topping. The salami was delicious – Kerri liked the taste but not the crispness, whereas I thought it was wonderfully crispy like the best bacon in the world should be. The base was thin and crispy too and not soggy in the middle like it sometimes is. Brilliant Friday night dinner… we’re sure that’s not just the prosecco talking! And as we had made two bases but only one pizza (we had loads of nuts and olives as a starter) there is another base to make pizza for lunch on Saturday. Mix the yeast, sugar and olive oil into the water in a small bowl, cover with a wet tea towel and place in a warm place for 10 to 15 minutes until foam starts to form on top. We put ours into the oven for this and turned it on very low – 50C – for a while then turned it off again. When the yeast has grown and foamed up, put the flour and salt into a large bowl and pour in the yeast mixture. Mix together to form dough and knead by hand or with a dough hook (we did a bit of both here) for 5 to 10 minutes until the dough has become a bit stretchy. Removed it from the bowl, lightly oil the bottom of the bowl, form the dough into a ball and put it into the bowl. Cover with the wet tea towel and leave it for half an hour to an hour in a warm place (back into the oven on 50C again for us) to rise. Then break the ball in half, form into two separate balls, dust with flour and roll out into a circle, then toss it a bit with some flour so that you don’t feel like you cheated with the rolling pin. That’s the hard bit. The easy bit is: Put a pizza stone into your oven and preheat to as high as it will go. When the oven is hot, take the stone out (carefully!) and place your rolled out pizza base onto it (carefully!). Top with a selection of interesting toppings and put back into the oven. Then sit and watch it through the window until it looks done. Then take it out, cut it and eat it, trying not to burn your mouth of course. Then discuss how it’s the best pizza in the world and from now on all pizzas will be this good. Subscribe to comments with RSS	or TrackBack to 'Brilliant Pizza'.